Hello World, Riley the Puggle here. I’m sorry it has been so long since I’ve written. Mommy has been lazy and hasn’t bought any batteries for her camera. And, like I always say, what’s the point of a blogpost without cute puppy pictures? Anyways, it has been an exciting week! Mommy & Daddy got engaged, which seems to mean that mommy just has a new toy I’m not allowed to play with on her finger. So, to celebrate, we went down to see my Grandmas, which means I got to play with my kinda cousins! Hanging out in the car. I hadn’t been down to see my parents families since I was really little. 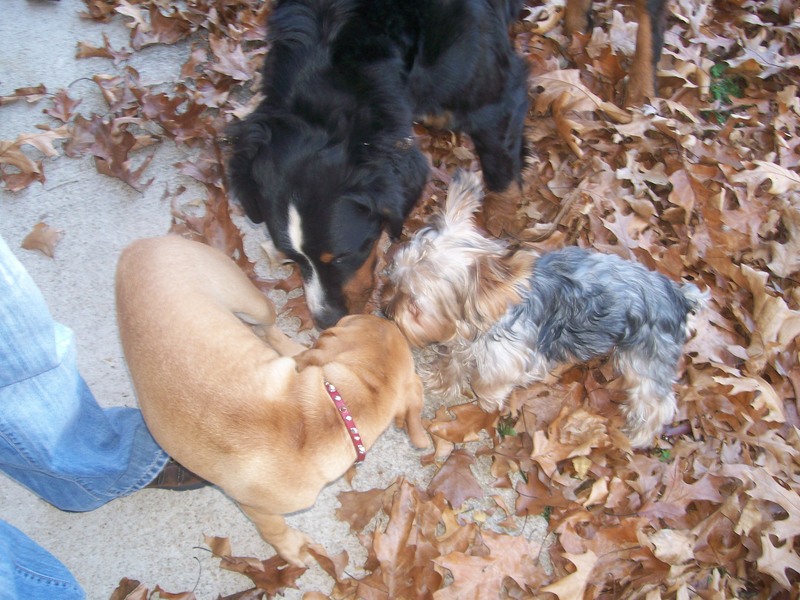 I was so excited to show my cousins how much I had grown, especially the little yorkie, Harley. Last time we met we were both about 8 pounds, but now, haha, I had doubled in size and he was still the same! I got to really show him who was boss. The other dog, Ernie and his brother Bert were still really really big. I keep trying, but I think it’ll take me a really long time to get that big. Well, in other doggy news, I just wanted to say a big hello to all my new friends!! It’s been soooo much fun reading other dogblogs and meeting you guys! I will try to make mommy keep up with her camera batteries better, I promise. How exciting Riley! You’re Mommy must be REALLY excited… My Mommy still keeps asking for one of those, but none yet! BOL… Maybe you can be the ring bearer in their wedding! BOL glad you had a good trip to the Grandparents, those trips are always the best! Lot’s of extra lovin’ for us! The conditioner from the Vet seems to have helped my itching and the new food isn’t so bad so keep your paws crossed I don’t start itching this week or else I will have to go back on Benadryl. Hi Riley. Please give your mommy and daddy a big tail wag for me. My mommy and daddy have been married for 30 years or a little over 4 dog years. My grandma came to visit us this weekend. She is so nice, she let me have a little piece of pizza crust for desert last night so I slept in her bed to help keep her warm. P.S. Your cousins are kinda cute!! Hi Riley! Tell your mommy congratulations! My mommy and daddy got me two years ago, right after they got married. I think I was the best gift daddy could’ve ever gotten mommy! BOL! you look really cute in your carseat. mommy tries to keep me in the backseat but I prefer to ride “shotgun” as the humans call it!! Hope you had fun with all your cousins!! Congrats to Riley’s mommy and daddy…and Riley too! You must be so excited! My mommy and daddy got me right after their wedding! Congrats again! I found your blog on DWB, and thought I’d drop by to say hello… It’s grrrrEAT to meet ya, man! 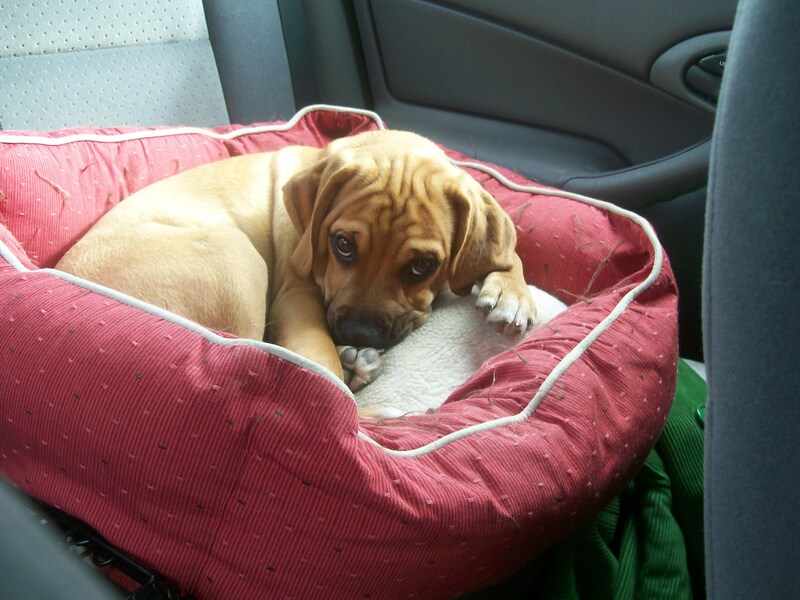 You are one cute Puggle for sure! Hi! My name is Eduardo, I’m a puggle who loves to snuggle! I added you to my blog I hope you don’t mind! Feel free to add me to your blog! I hope we can be friends! my name is maui, and i managed to sneek into mommy’s comp to read up on other fellow cute pups! glad i found yours. i’ll have to tell mom to add you to her blog roll of cute pups!